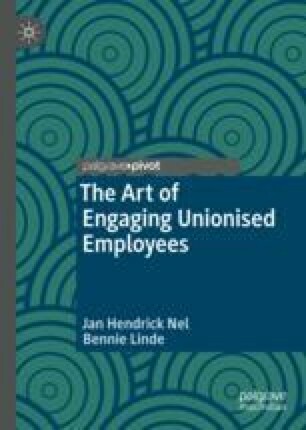 Employee engagement is an emerging concept in the literature which demonstrates organisational benefits, yet little is known about the antecedents of engagement in a unionised environment. The purpose of this chapter is to identify the researched and validated antecedents of, and outcomes of, engagement through a systematic review of the literature that will have the greatest potential to increase the levels of engagement in a unionised environment. The synthesis of the results shows that engagement is considered a mediating variable in which antecedents influence engagement levels and engagement in turn leads to individual and organisational outcomes (Saks and Gruman, Hum Resour Dev Q 25(2): 155–182, 2014). Job resources, individual psychological states, leadership and a positive perception of the organisation have emerged from the synthesis as having a strong impact on the outcomes of engagement (Bailey et al., The meaning, antecedents and outcomes of employee engagement: A narrative synthesis. Int J Manag Rev 00: 1–23. doi:10.1111/ijmr.12077, 2015).